Frequent metal-detecting between 2001 and 2014 recovered a Neolithic/Bronze Age flint flake; Roman, medieval and post-medieval pottery sherds; a fragment of undated Rhineland lava quern; Iron Age, Roman, medieval and post-medieval coins; medieval and post-medieval jettons; post-medieval tokens and Late Bronze Age, Iron Age, Roman and Middle Saxon to post-medieval metal objects. The metal finds include Roman brooches; a Middle Saxon pin; a Late Saxon to post-medieval spindle whorl; medieval to post-medieval dress accessories; a medieval lead ampulla, coin weight, figurine, padlock, harness mount, thimble and pendant; a medieval/post-medieval spindle whorl, copper-alloy vessel rim and vessel repair; a post-medieval knife end-cap, particularly fine silver dress hook, harness mounts, key, apothecary weight and furniture fitting and undated casting waste and weights. December 2001-January 2002. Metal-detecting. In northern part of field. A. Rogerson (NLA), 4 February 2002. A. Rogerson (NLA), 4 March 2002. A. Rogerson (NLA), 10 April 2002. Medieval brooch made from a late 13th century jetton. Medieval and undatable metal finds. A. Rogerson (NLA), 10 May 2002. 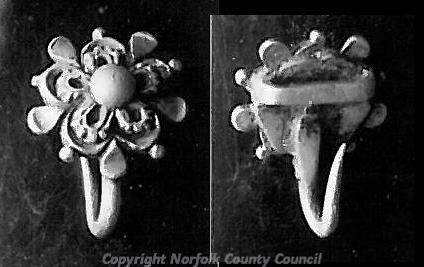 See file for BM coroner's report on post-medieval silver dress hook found January/February 2002. A. Rogerson (NLA), 23 September 2002. Post-medieval token and coin weight. A. Rogerson (NLA), 8 January 2003. One medieval and two post-medieval coins. Post-medieval token and metal objects. A. Rogerson (NLA), 10 March 2003. One Roman, one medieval and five post-medieval coins. A. Rogerson (NLA), 8 September 2003. Silver dress tag found January/February 2002 is illustrated, described and discussed in (S1). A. Rogerson (NLA), 7 September 2004. Medieval and post-medieval metal objects, post-medieval jetton. A. Rogerson (NLA), 9 October 2005. 11 November and 4 December 2005. Metal-detecting. One medieval and one post-medieval coin, token and jetton. Post-medieval belt mount and sherds. A. Rogerson (NLA), 10 January 2006. Post-medieval coins, token, jettons and metal objects. A. Rogerson (NLA), 8 February 2006. 15 and 29 January 2006. Metal-detecting. Two post-medieval coins and jettons. A. Rogerson (NLA), 8 March 2006. One post-medieval token, post-medieval metal objects. A. Rogerson (NLA), 5 May 2006. Six post-medieval coins and four jettons. A. Rogerson (NLA), 2 February 2007. Two Roman, two medieval and fifteen post-medieval coins. 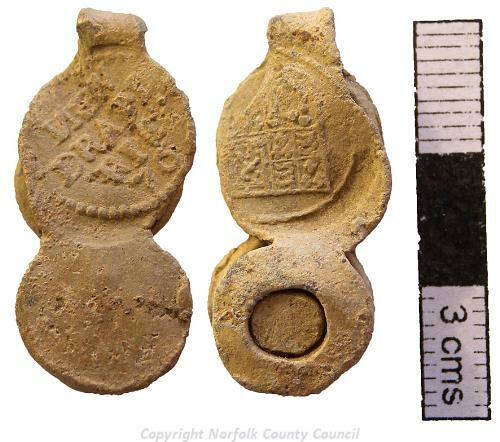 Medieval and post-medieval jettons, post-medieval token and coin weight. A. Rogerson (NLA), 13 March 2007. Two post-medieval coins and two post-medieval jettons. A. Rogerson (NLA), 5 April 2007. One Roman, one medieval and five post-medieval coins, medieval and post-medieval metal objects. A. Rogerson (NLA), 5 May 2007. Post-medieval buckle, one medieval and five post-medieval coins, one post-medieval token and three jettons. A. Rogerson (NLA), 8 June 2007. Two post-medieval coins, one post-medieval jetton, medieval and post-medieval metal objects. Two post-medieval coins, one token, medieval and post-medieval metal objects. A. Rogerson (NLA), 8 October 2007. Medieval, medieval/post-medieval and post-medieval metal objects, two post-medieval coins and one jetton. Two medieval and 10 post-medieval coins; post-medieval jettons and tokens; medieval, medieval/post-medieval, post-medieval and undatable metal objects. One Roman and one post-medieval coin; Roman, medieval and post-medieval metal objects. A. Rogerson (NLA), 8 August 2009. One Iron Age and one post-medieval coin; medieval and post-medieval metal objects. A. Rogerson (NLA), 15 and 31 August 2009. Medieval and post-medieval coins, three post-medieval jettons, two medieval buckles, a post-medieval buckle, spur rowel and dress fastener. A. Rogerson, (NLA), 25 January 2010. Medieval, medieval/post-medieval and post-medieval metal objects, three post-medieval coins and two jettons. A. Rogerson (NLA), 10 May 2010. 21 and 27 August 2011. Metal-detecting. Three post-medieval coins, one medieval and one post-medieval jetton, medieval, medieval/post-medieval and post-medieval metal objects. A. Rogerson (HES), 12 October 2011. 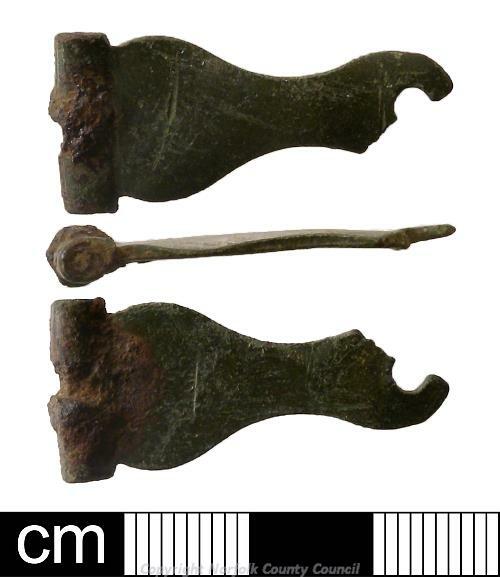 Late Bronze Age copper alloy socketed axe fragment (S2). Late Saxon to post-medieval lead annular spindle whorl. 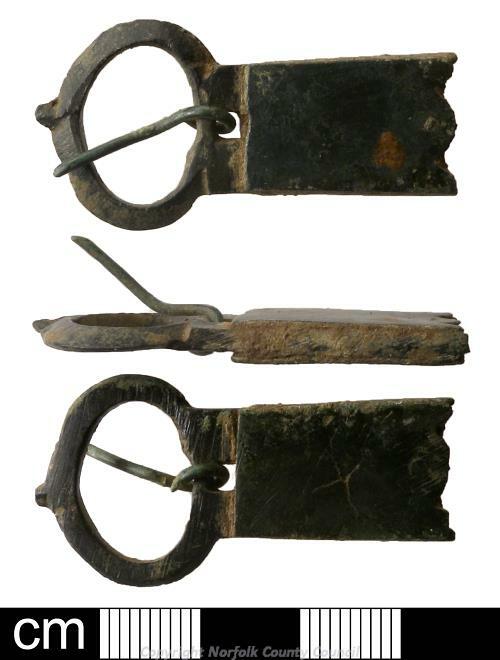 One medieval coin, two buckles, two strap-ends, a rectangular strap mount, casket key and lead vessel repair or pot mend. Five post-medieval coins, four jettons, four buckles, a trade weight, harness mount, hinge plate, crotal bell, lead powder holder cover, flask cap or measure and a lead toy dish or plate. A. Beckham (HES), 2 November 2012. 2 post-medieval coins, 2 jettons and harness mount. P. Watkins (HES), 2 October 2013. Fragment of undated Rhineland lava quern. 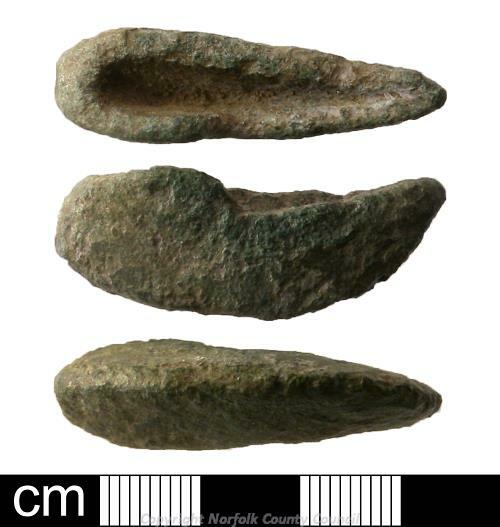 Post-medieval knife end-cap and a harness mount. 1 medieval coin and a thimble. 1 post-medieval token, 1 jetton, buckles, a harness mount and a strap fitting. <S1> Article in Serial: Thornton, D. & Mitchell, D.. 2003. Three Tudor Silver Dress-Hooks.. Antiquaries Journal. pp 486-491. <S2> Illustration: Gibbons, J.. 2012. 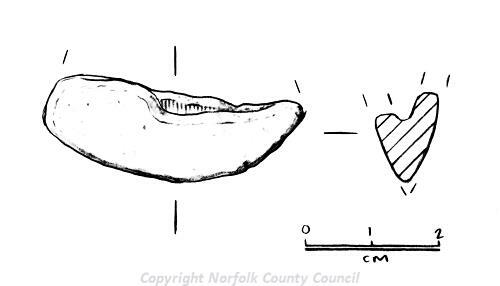 Drawing of a Late Bronze Age socketed axehead fragment.. Film. 1:1.